Should read: ".... X is the number of unique Greyjoy Warship cards you control." 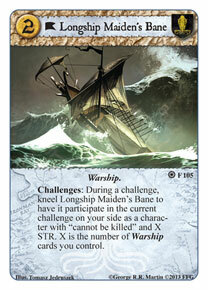 Challenges: During a challenge, kneel Longship Maiden's Bane to have it participate in the current challenge on your side as a character with "cannot be killed" and X STR. X is the number of unique Greyjoy Warship cards you control. how does this work with desolate passage? The effect on Desolate Passage says you can't declare, so Maiden's Bane will ignore the Declare Attackers/Declare Defenders step and just add itself to the challenge. would the lanni Iron throne be able to cancel this ability? as when you look back to see what type of ability was trigger maidensbane is a char. "Response: Kneel The Iron Throne to cancel a character ability just triggered. Then kneel that character, if able." This response would have to fire before the resolution of LMB's effect. LMB doesn't become a character until its Challenges effect resolves. So I would say no, as LMB is not a character when the effect is triggered. If i use white harbours dromon to maidens bane. Win challenge and go back to being location can i keep my power and does it count to winning 15powers? And then if i stand it and win challenge again do i still have renown? The power stays on the card, but it doesn't count toward the 15 you need to win while the card is not a character. So when it goes back to being a location, it doesn't count, but the next time you trigger its effect and it becomes a character again, it will. Ultimately, I'd say LMB does not regain the renown it got from the Dromon if you manage to use its ability a second time during the same phase. This is because each time you trigger the ability, it effectively becomes a different character. Therefore, it is not "that character" chosen by the Dromon anymore. But its still unique so there can be only.one. are u certain about this? Yes. I'm certain. The fact that the card is unique doesn't make any difference. When it reverts from character to location, the effect that made it a character ends. That means the character it was during the challenge is gone and the card is only a location at that point. Triggering the effect a second time does not continue the previous effect; it starts a new one. It doesn't matter that it's the same piece of cardboard - triggering the effect a second time does not turn it into the same character because that character went away when the previous effect ended. Activating this ability still counts as kneeling a location, regardless of what card-type it becomes/counts as do to the result of its effect, correct? e.g., If a player wanted to trigger Hellholt Docks when another player used LMB's ability. Yes, it says "kneel LMB to" which means that you must have knelt it as a location before it became a character. When warships turn into characters (maiden's bane, iron fleet scout, etc. ), do they keep their warship trait ? Yes, the effect turns the card into a character with a strength value, but otherwise everything about the card is the same. It should also be noted that although it participates in the challenge, it has no icons, so effects like The Windblown (AHM) that prevents characters with fewer than 2 icons from counting their strength can still stop this card even though it can't be killed.